While researching something else entirely I came across Dr Benjamin Moseley and an old controversy with very modern echoes. Benjamin Moseley was born about 1746, son of Edward Moseley of St Osyth on the north Essex coast. On the 22nd of October 1765 he was granted the Freedom of the City of London by Redemption, paying forty-six shillings and eight pence for admission to the Company of Woolmen. His father was recorded as ‘Gent’ and, combined with the location of the family, this suggests that they had made their money as sheep farmers supplying fine English wool to the world. Benjamin was trained as a doctor in London, Leiden and Paris and settled in Kingston, Jamaica about 1767, practising as a surgeon apothecary and eventually becoming Surgeon General. He also served as an Assistant Judge in the parish of St Andrew. On the 9th of January 1768 he married Martha Clare, by licence, in Spanish Town. Of their children only two outlived their father, a son William Henry born about 1777 who in due course followed his father into medicine as an Army doctor but who died only four years after his father; and a daughter named Martha Elizabeth born about 1781. Nothing more is known of Martha Clare who may have died in Jamaica. There is an interesting note on the parish register for St Osyth – “At front: note of outbreak of smallpox from which 86 persons died, 1737-1738” (now held at the Essex Record Office in whose SEAX database I found it). St Osyth is a very small place, so the village memory of this disastrous event may have coloured Benjamin’s childhood. 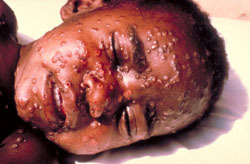 In any case when he arrived in Jamaica he would have become very aware of the devastating effect of smallpox epidemics. 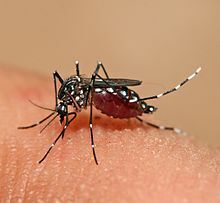 Normal mortality in such epidemics was about 30 percent, although a milder form had only a one percent mortality, however there was a hemorrhagic form that was almost invariably fatal. No wonder then that a slave who could be certified to have had the disease and have recovered, usually evident from the sometimes terrible scarring it caused, commanded a higher price. By the second half of the eighteenth century most planters were having all their slaves inoculated. While there was little that could be done to treat the disease once caught, knowledge of inoculation had spread from China, India and the Arab world into Europe by the eighteenth century. The technique involved taking some of the pus from the lesions of an infected person and introducing it into the person to be inoculated via a small cut or scratch. Sometimes the person doing the inoculating would travel around taking the sick person with them to provide live material. Sometimes dried matter was used and was inhaled. The result was that the person being inoculated caught smallpox, but usually in a mild form, from which they recovered in a couple of weeks or so. However there were fatalities. One high profile death was that of the young Prince Octavius, son of George III who had all his children inoculated. At the end of the eighteenth century Edward Jenner made a scientific study of inoculation using cowpox – hence the new term vaccination – first inoculating with cowpox and then testing its efficacy by infecting his subjects with smallpox. The cowpox made them slightly unwell, and they failed to catch smallpox. In due course vaccination replaced inoculation with smallpox as being the safer option. It was not however uncontroversial. 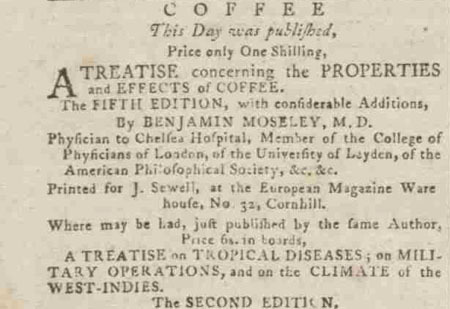 Benjamin Moseley had written a number of treatises – on the benefits of coffee and sugar (in which he had a financial interest!) and on dysentery, another killer scourge in Jamaica especially amongst the troops stationed there. He has a small place in history however as a vocal and high profile opponent of vaccination. He was not opposed to the principle of inoculation and like many doctors made a living using the traditional method. However the arguments against introducing animal matter into humans, mainly children, have a modern parallel in those who oppose, for example, the use of pig heart valves in humans. Although the notion featuring in cartoons of the time, that those vaccinated with cowpox might turn into cows seems extreme to us now, given that the understanding of disease and its causes was rudimentary, the anxieties are understandable. Although eventually vaccination resulted in the world-wide banishing of smallpox in the wild to a small number of (hopefully) very secure laboratories, the same is not true of measles. Also an epidemic killer, routine vaccination, compulsory before school admission in some countries, has significantly reduced but not yet eliminated the disease. Recent outbreaks in the UK have been attributed to a scare a decade ago, echoing Moseley, that the vaccine could cause autism. That claim has been totally discredited but a generation of children grew up who had neither had measles nor been vaccinated, with the result that mass vaccination is now being offered to those who had missed out in order to contain the spread of what can be a fatal illness. Benjamin Moseley had built up a large and wealthy clientelle in England based around his Jamaican connections. This gave him both influence and access to the means of widely publicising his views. Similarly in the MMR vaccination scandal in the UK, access to media, happy to play on the natural fears of parents who only want the best for their children, facilitated the spread of a scientifically discredited theory. It seems little had changed in two hundred years.